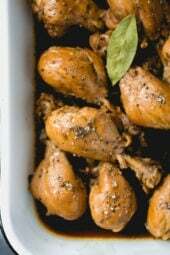 Filipino Adobo Chicken – Chicken braised in vinegar and soy sauce with lots of garlic. This easy, savory chicken dish has become a staple in my home. As this simmers, your kitchen will be filled with an intoxicating sweet and sour aroma that will leave you anxious to eat. 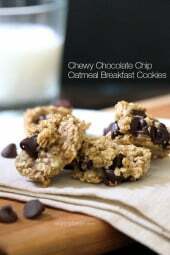 Not only is it so easy to make, but because it’s incredibly flavorful and my kids love it! More of my favorite, easy to make chicken dishes are Braised Chicken Thighs with Mushrooms and Leeks, Chicken Thighs with Shallots in Red Wine Vinegar (Poulet Au Vinaigre), and One Pan Parmesan Crusted Chicken with Broccoli. 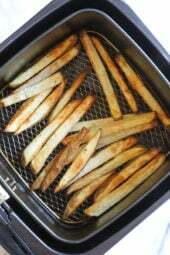 I first shared this recipe back in 2010, but I thought the photos needed some updating as you can see the image below. My friend Liren of Kitchen Confidante was so gracious to share her family recipe with me, which I slightly modified to reduce the fat. We serve this over basmati rice which makes it a complete meal. It’s recommended marinating this overnight but if you’re pressed for time, it’s still delicious if you don’t. I prefer dark meat when making chicken stew; legs and thighs both work well. Marinate chicken in vinegar, soy sauce, garlic, jalapeño and pepper, for at least an hour (overnight is ideal). Put chicken, 1/2 cup water, bay leaves and marinade into a deep nonstick skillet and cook on medium-low heat. Cover and cook until the meat is tender, about 45 minutes. Remove the cover and cook an additional 15 minutes, until the sauce reduces. Discard bay leaves and serve over rice if you wish. Mine is a bit bitter or sour can brown sugar be added to cut the sourness? My fiance and I loved this! I only marinated the chicken for an hour and it turned out great. I used 9 chicken legs based on what my grocery store had and just made a bit more marinade. I also used two crushed garlic cloves. Served with rice, black beans, and avocado – this is added to our roation! Super easy to make, the only problem is finding a place with 8 chicken legs. I ended up just using six, and the chicken gets so tender that it really is falling off the bone. If you are lucky enough to have a larger family I would suggest two or three legs a piece, or attempt the same recipe with chicken thighs. Goes great with roasted zucchini, yellow squash, and yellow onion. I’ve made this 3 or 4 times. I enjoy it everytime. 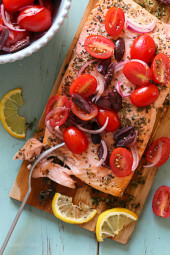 Very simple, and savory…great for winter. Marinating overnight is preferred. Was very excited to make this recipe. Whole family tried it, and no one enjoyed it. Has a strong sour taste, so make sure you like sour. Simple to make, but just was not a hit with our crew. Odd this one shouldn’t be sour, we love this dish! SO much it’s on constant rotation. Instant Pot instructions for this? Also, if it’s in the instant pot, is marinating for an hour still recommended? I haven’t tested yet but my guess is 20 minutes, natural release. Let me know! Did you try it in the instant pot? What’d you do and how’d it turn out?? I think 20 minutes would way overcook it, I’d suggest 5 (12 if frozen). And either reduce the liquids by half or, once the IP has released, remove the chicken and use the saute setting to reduce the braising liquids. 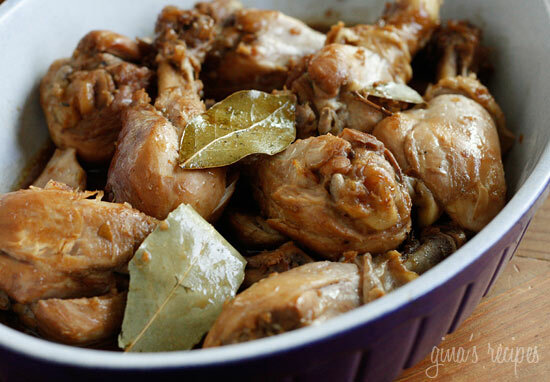 I used this recipe to make Chicken Afritada- another Filipino fave dish. I marinated the chicken with soy sauce and 2 med sized tomatoes, 1/4 tsp of salt and pepper. Browned med size diced onion (yellow) and 1/2 TBS of garlic (minced) in 1 TBS olive oil. Add chicken and marinade to sauted onion and garlic. Add 1 small can of tomato paste and let it all simmer in low heat for 10 – 15 mins until done. Serve with warm cauliflower rice. 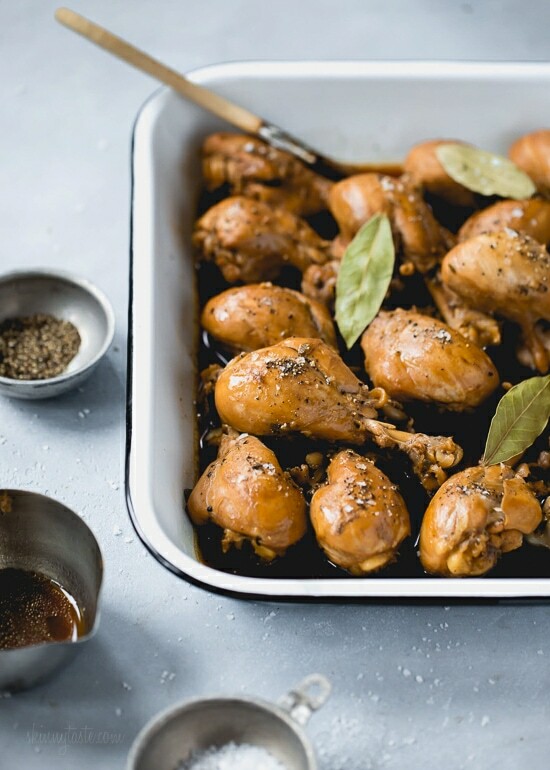 Could you make this recipe with boneless chicken thighs instead of drumsticks? I made this today (marinated over night). Wonderful. I have an AGA and therefore like to do most of my cooking inside the oven instead of on the stove top, so I did this dish in the oven at 350 degrees for an hour with the lid on the whole time, and it was superb. This is a staple in my house growing up. 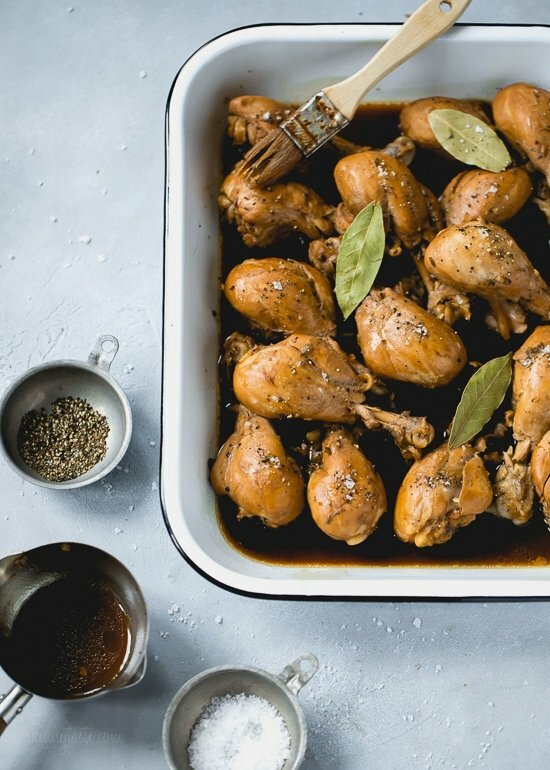 This is the ultimate one pot dish… my family recipe doesnt marinade the chicken ahead of time. I have modified my mom’s recipe (same ingredients) by broiling it in the oven after the chicken is cooked to give it a bit of a crust or add a star anise or two to add a little more flavour to it. Also if you can get a hold of sugar cane vinegar or tomato vinegar… it makes it taste even better. What is the approximate weight of the 8 chicken legs? 2lb? 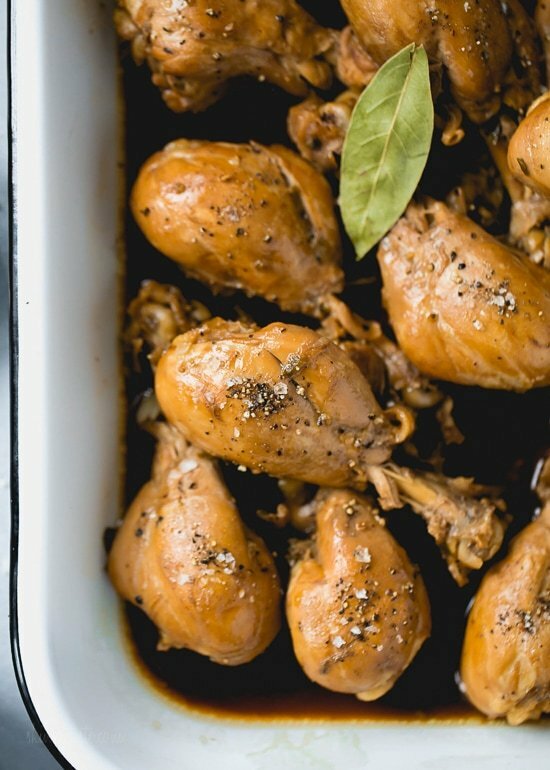 How can I cook this in the instant pot? I’ve made it on the stove and it’s fantastic. I love this recipe. I’ve been making it for years. ???? It doesn’t say what oven temperature?? This cooks on the stove top, not in the oven. Do you have pressure cooker or slow cooker instructions for this recipe? I’m thinking frozen chicken breasts cooked all day on low with all ingredients and shred chicken at end. I plan on trying it this week. Fingers crossed! There is a recipe where they cook it down until the sauce is almost syrupy and saute the chicken until it is crisp. Then serve the sauce on the side. Love it ! Making it again now for the 2nd time this week!!! Can this recipe be baked in the oven? And if so, what temperature would you suggest?